Make your writing dreams a reality. 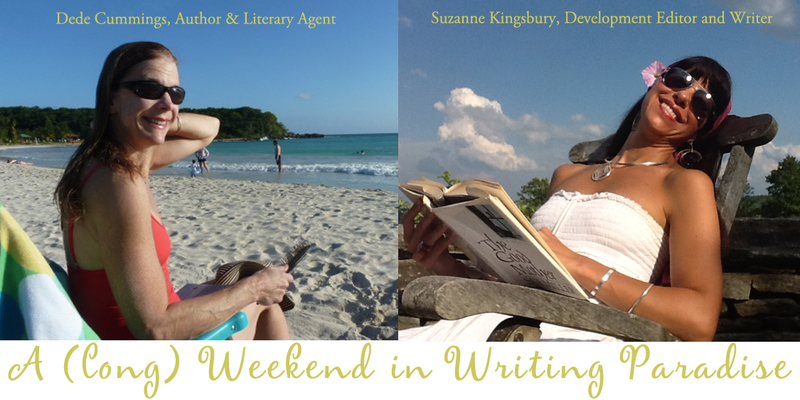 Clarify your writing goals, Bounce your work off of us, Learn the writing trade, Meet other authors, Relax, Laugh! This is the view from our dock—imagine quiet mornings, yoga, coffee on the dock, followed by workshops and a great group of people in a gorgeous setting. Dede Cummings started her literary career as a book designer for Little Brown & Company, and a designer and production editor for David R. Godine. As a designer, she is a six-time winner of the New England Book Award for a number of authors’ works, including Slow Learner by Thomas Pynchon, Voices From The Moon by Andre Dubus, a reissue of Borstal Boy by Brendan Behan, four books by Mary Oliver, and others. Dede is a 2010 graduate of Harvard’s “Publishing Books, Memoirs and Other Creative Non-Fiction,” and has since become a publicist and literary agent for emerging writers of all genres. Dede has been coined one of those most accessible and yet well-connected agents starting out in the business. Because she is an author herself, she understands both sides of the publishing process. She has been a contributor to Mademoiselle Magazine, Connotation Press, the Bread Loaf Writers Conference, and she received the Mary Dunning Thwing Award, a Bennington Writer’s Workshop award to study with Hayden Carruth, and was a semi-finalist for the Discovery/The National poetry award. Her first book, Living With Crohn’s & Colitis: A Comprehensive Naturopathic Guide for Complete Digestive Wellness, was published in 2010 by Hatherleigh Press, distributed by Random House. In Rhode Island, she will help you think about all aspects of publishing from pitch to publicity. Following the Retreat, she will be at the National Publicity Summit in New York City (October 17-20th), with the intent to make contacts for her writers at this premier event!!! She is excited to meet you in Rhode Island. Suzanne Kingsbury is the author of two coming of age novels, The Summer Fletcher Greel Loved Me and The Gospel According to Gracey, both published by Scribner, optioned for film and sold extensively in the States and abroad. Her work has appeared in numerous anthologies, and she has appeared in People magazine, Glamour and Atlanta magazine among many others. As founder of Wild Words, she developed a method of teaching built from neurotheologic research at Penn and Harvard. By ceasing activity in the part of the brain associated with negativity and resistance and focusing on writers’ strengths, any weakness in craft falls away, and writers can reach previously unimaginable creative heights. She has helped over fifty writers become authors and make their writing goals a reality. In Matunuck she we will meet with you individually to discuss your writing project and to help see you through to the places you want to go with your writing.